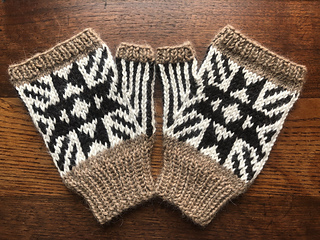 These striking fingerless mitts are knit in the round and feature ribbed cuffs, a gusseted thumb, and a bold color work motif inspired by the beautiful geometric patterns found in Native American artwork. The stranded color work creates a super cozy double-layered fabric via the floats that are carried along the inside of the piece. 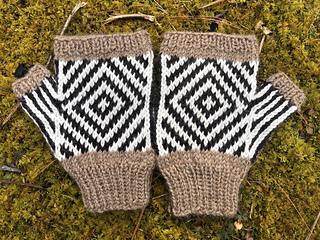 Worked in a 100% alpaca yarn, you’ve got the ultimate in softness, warmth, and wearability! 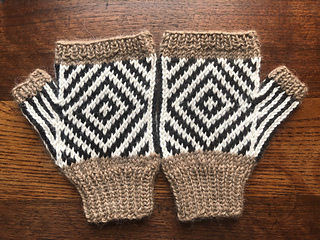 Sized for adults in S (M, L) to fit 6.75 (7.5, 8)” / 17 (19, 20.5) cm hand circumferences and intended to be worn with 0.25” / 0.5 cm positive ease. To determine the correct size, measure around the widest part of the wearer’s knuckles and choose the closest matching size. If in doubt, go up a size. Hand Circumference: 7 (7.75, 8.25)” / 18 (19.5, 21) cm. Length: 6.5 (6.75, 7)” / 16.5 (17, 18) cm. Color 3, #03 Bullrush, 44 (64, 84) yards / 40 (59, 77) m.
25 sts & 25 rnds = 4” / 10 cm on larger needles, worked in the rnd in Desert Star color work pattern and measured after wet blocking. 4 stitch markers (1 unique, 3 matching), and a yarn needle. Use DPNs, two circular needles, or one long circular needle, according to your preferences for small circumference knitting in the round.